VietNamNet Bridge – An exhibition named Tranh Tối Tranh Sáng (The Twilight between Light and Darkness) has opened in Hanoi for fans of contemporary art. 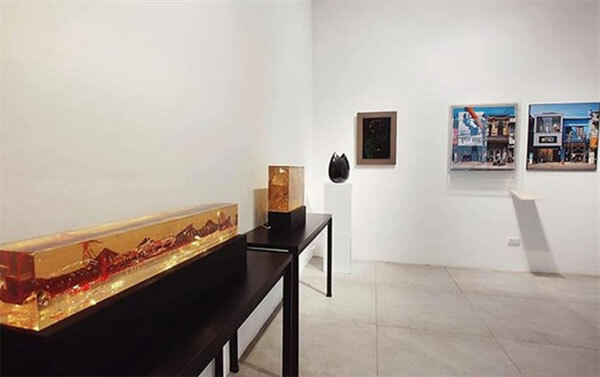 The exhibition features more than 20 works (including paintings, videos and objects) by 15 contemporary artists from various studios in Hanoi, Thai Binh and Hue including Nguyen The Son, Tran Hau Yen The and Vu Kim Thu. The exhibition uses lighting technology to create different effects. “This exhibition is a combination of works, reiterating the inspiration of the teamwork of the 15 artists who participated in the art project in the National Assembly basement recently,” said the exhibition’s curator, visual artist Nguyen The Son. “It is a project of continuous effort in a relatively short time trying to bring the artistic practices of contemporary trends with its capacity of interacting and initiating dialogue with the very special cultural, historical and political space of the National Assembly,” Son said. A 28-minute documentary film will also be shown, telling the story of the three-month process the 15 artists and more than 100 handicraft artisans and technicians undertook to complete the art project in the basement of the National Assembly building last November. The exhibition is open to the public until March 12 at 12 Hoa Ma Street.